which stick on above eyebrow. its take some time to decorate your forhead. either known as bridal bindi or dance performers. Box of 50 Bindies in assorted design and colors with good quality of Glu, stone and designs. When the bindi properly marked, becomes the central point of the base of the creation itself. It is a symbol of auspiciousness, good fortune and festivity. The very positioning of the bindi is significant. The area between the eyebrows is the seat of latent wisdom. This area is known as the "Agna" (6th chakra) meaning "command". It is said to control various levels of concentration attained through meditation. The central point of this area is the "Bindu" wherein all experience is gathered in total concentration. Tantric tradition has it that during meditation, the "kundalini" - the latent energy that lies at the base of the spine is awakened and rises to the point of sahasrara (7th chakra) situated in the head or brain. The central point, the bindhu, becomes therefore a possible outlet for this potent energy. It is believed that the red kumkum lies between the eyebrows to retain energy in the human body. The decorative bindi, also called bottu, tilak, tika or kumkum, has long been associated exclusively with Hindu women but, as a look at fashion magazines around the world will prove, these days are long gone. Today, decorative or sticker bindis come in all sizes, colors and variations and can be worn by young and old, married and unmarried women of any religion alike. Indian Bindi Designs The red dot on the forehead was traditionally drawn by hand by dipping one’s fingertip in red vermilion or kumkum powder and applying as round a dot as possible. In fact, bindi means round in Sanskrit and bottu, going back to Dravidian sources, means fingertip. shapes: dots, diamonds, daggers and lines colors: any color matching any dress shade materials: from felt to adhesive stickers to traditionally drawn bindis decorations: rhinestones, sequins, glass beads and gold and silver threads The Significance of the Bindi The bindi is usually placed between the eyebrows, the location of the sixth chakra or energy center. It is called ajna and said to be the “seat of concealed wisdom” and the exit point for spiritual energy. Applying a bindi in this ajna spot is supposed to strengthen concentration and retain energy. The bindi is also said to ward off the evil eye in the form of demons or bad luck. Traditionally, the bindi has been the symbol of a married woman whose husband is alive, therefore widows were not allowed to wear it. In fact, during the husband’s funeral, the red kumkum powder once used for drawing the bindi is thrown on his body while it is wiped from his wife’s forehead. Today, some widows wear bindis as do unmarried women and women and girls who are not Hindus. The History of the Indian Bindi The earliest references to the bindi in the literature were drawings in third- and fourth-century texts showing Hindu women with bindis. It is assumed today that the bindi was used to distinguish women from different castes if and by the way they wore their bindis – what color they had and what shape. Even in ancient times, bindis used to be not only red, but also white, yellow, brown and black, depending on the material they were made from – plants, seeds, fruits or soot. Red was always a color considered auspicious and therefore used on most occasions. Add a zero to figure one and its value will increase ten times. Likewise, place a bindi (dot) on your forehead after make-up and the charm of the face will enhance ten times. 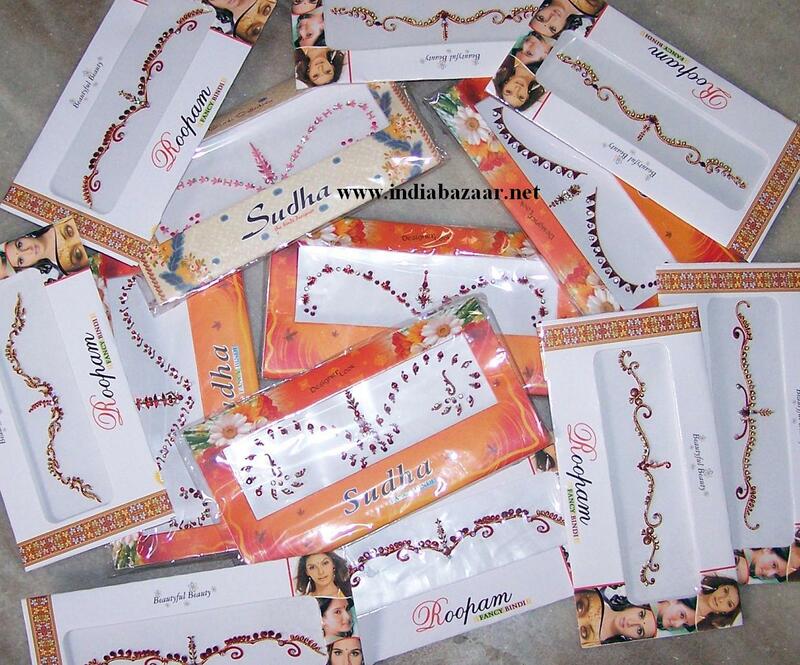 Bindi (also called bindiya) is a symbol, not only of beauty but of your Suhag too - an indication of a married woman. A married Hindu woman uses various symbols - sindur, bangles, man gal sutra, bichhuye on the toes and' alta' on feet. Likewise, bindi is a symbol of good luck and purity. It has found its way in folk-literature, poetry, sculpture and other forms of arts and literature. In ancient times bhasm (sacred ashes) or chandan (sandalwood paste) were used on fore­head by men. Women decorated the forehead with a red dot symbolic of good luck like the rising sun. They used materials varying from roli, kumkum, sindur. Today, bindis are available in different colours to match your makeup and dress. Although, traditionally only a round dot is permissible, these days the bindis are available in many shapes, some of them being religious symbols like trident (trishul), conch (shankh), star (tara), lamp (deepak) and so on. Today even unmarried women use bindi. The colour of your dress and the shape of your face should determine the shape, size and colour of the bindi you choose. Some popular motifs available are - round, long, oblong, triangular, crescent moon, a round bindi with small dots surrounding it, etc. You are the best judge to decide what suits you. Some tips are, however, given here. A small forehead appears large with an oblong bindi. A broad forehead looks good with a round bindi. On a fair complexion, red looks striking whereas on dark complexion pink, orange or sandalwood colour appears prominent Wheatish complexion requires a light red bindi. If the skin is very dark, do not use red, steel grey or chocolate colours. For large eyes, big bindi is suitable, for small eyes a small bindi. Height and shape of body are also determining factors. For example, a tall woman should use round shaped bindi, a short woman should put on longish-shaped bindi. If you have a brut forehead, place bindi in the middle, but if you have a narrow forehead put it betWeen eyebrows. In summers, light-tinged bindi looks pleasant; in winters and at night bright colours appear prominent. If bindi matches your dress in colours, entire dressing-up acquires a typical beauty. For middle-aged women it is advisable to use deep colours which lend gravity and soberness to their personality.